The Go-Lite Bariatric Rollator by Drive Medical comes in an attractive red finish. It is constructed from a strong, steel reinforced frame that supports 500 lbs. And comes standard with a large, comfortable, soft padded, oversized seat with a large basket that is mounted underneath. The basket easily and securely transports personal items. The large, 8 caster wheels are ideal for indoor and outdoor use ensuring a smooth ride over most surfaces. Special loop lock made of internal aluminum casting operates easily and ensures safety. 8 casters with soft-grip tires are ideal for indoor and outdoor use. Comes with large 21"(W)x6"(H)x9(D) basket that can be mounted under seat. Tool-free removable padded backrest for comfort. Handles easily adjustable in height with self-threading knob. Actual Product Weight: 26 lbs. Handle Height (Max): 39.5. Handle Height (Min): 35.25. Overall Product Height: 35.25. Overall Product Length: 26.75. Overall Product Width: 30.5. Primary Product Color: Red, Blue. Product Weight Capacity: 500 lbs. Seat to Floor Height: 22. Product Assembly: Basic Assembly Required. Product Installation: No Installation Required. Allergy: Not Made With Natural Rubber Latex. The item "Drive Medical Heavy Duty Bariatric Rollator Rolling Walker with Large Padded" is in sale since Thursday, July 12, 2018. 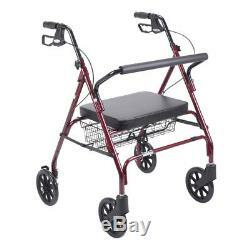 This item is in the category "Health & Beauty\Medical & Mobility\Other Mobility & Disability". The seller is "powermedicalsupplies" and is located in Roslyn Heights, New York. This item can be shipped to United States, Canada, United Kingdom, China, Mexico, Germany, Japan, Brazil, France, Australia, Denmark, Romania, Slovakia, Bulgaria, Czech republic, Finland, Hungary, Latvia, Lithuania, Malta, Estonia, Greece, Portugal, Cyprus, Slovenia, Sweden, South Korea, Indonesia, Taiwan, South africa, Thailand, Belgium, Hong Kong, Ireland, Netherlands, Poland, Spain, Italy, Austria, Bahamas, Israel, New Zealand, Philippines, Singapore, Switzerland, Norway, Saudi arabia, Ukraine, United arab emirates, Qatar, Kuwait, Bahrain, Croatia, Malaysia, Chile, Colombia, Costa rica, Dominican republic, Panama, Trinidad and tobago, Guatemala, El salvador, Honduras, Jamaica, Viet nam.